Strike at the most vital spots - select the most effective techniques. Use punches, or long reaching high kicks, connecting from the shin down. 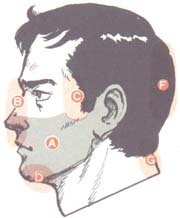 When aiming at bone, or hard areas such as the back of the neck, use the elbows or knees. Use punches or middle kicks connecting from the knee or elbow. Sinking a hard middle kick into the body is especially effective. Use lower kicks connecting from below the shin, In softer areas, such as the thigh, also use the elbow strike. ***Once the opponents defence is broken, you can use any kick or punch on any part of the body. Joints are a good target.